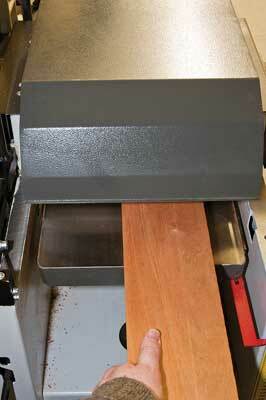 I owned a Kity 637 10in planer thicknesser for 12 plus years and it served me very well. However, during my latest project its shortfall in power and capacity became increasingly apparent prompting me to search for an upgrade. My primary requirements were increased depths of cut, 12in planning width, longer tables and a fence that didn't have to be removed when thicknessing and would robustly maintain its setting. I also developed a preference for parallel lift tables for space efficiency. After researching and trying a number of machines I committed to the Startrite based on a performance/cost equation. The machine arrived well packed, bolted down to a large pallet and suitably protected from weather. If, like myself, you don't have lifting gear or pallet trucks you need to consider how easily can it be dropped in your workshop and then how you get it off the pallet. Once on the ground the time proven Egyptian methods of timber levers and pivot blocks do make one man manoeuvring of the machine into final position fairly easy. The loose parts also fixed to the pallet, primarily the fence components, were straightforward to assemble. The first thing that struck me was the solid construction of the machine. This is a very heavy machine at 360Kg and you can see the reason throughout the construction. The sheet steel is of a good gauge and there's extensive use made of cast iron in both the tables and bracketry. The machine is what I would expect of a quality tool. The tables are smooth, flat and finish ground, which I prefer to a milled finish. Castings are well fettled and the fabrications deburred to the extent that I couldn't find any sharp edges or corners to injure or catch myself on. Moving parts run smoothly without play and the overall finish of machined parts is very good. 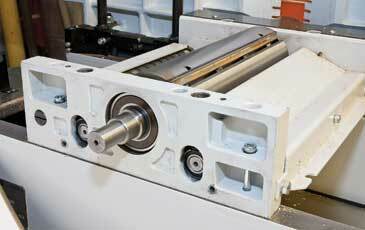 The all-important 3-blade cutter block is 100mm diameter and mounted through large bearings into substantial cast iron trunnions that also locate the thicknesser feed rollers. rated 3KW motor that requires a 16A supply. This has proved man enough for all my work so far. In use this heavy construction clearly contributes to the smooth finish obtained on work pieces, through minimal vibration and flexing. A uniform paint finish is applied to all non-working surfaces including the underside of tables and the inside of the base cabinet. The machine is compact but cannot be positioned right against a wall as the fence support bar projects rearward. 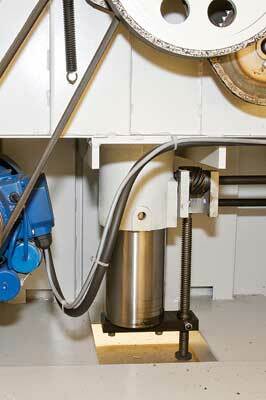 The minimum distance needed from the rear face of the machine to the wall is 370mm. However, provided clearance is left for the fence bar travel, other equipment can be placed behind the machine as the parallel lift tables intrude little into that space. The in-feed table depth of cut adjustment, up to a maximum of 5mm, is achieved quickly by moving a short lever in the vertical plane. This works effectively, although a little on the stiff side, making very fine adjustment a bit hit and miss. A Bristol lever alongside it then locks the position. The arrangement looks cramped but actually works well by just sliding your hand forward and actuating the lock with the thumb. 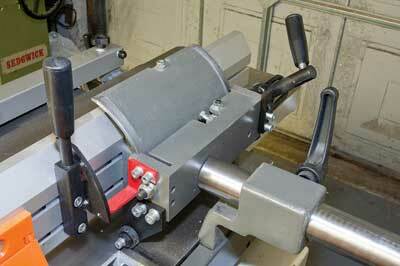 The cutter guard is a smart aluminum extrusion clamped to a substantial pressed steel control arm. Rise and fall is adjusted by a knob at the pivot end and a quick release mechanism enables it to be efficiently rotated 180 degrees out of the way for cutter maintenance etc. The table length of 1500mm I found to be competitive for this size of machine and fully meets my needs. The fence is exceptional and the best of all the machines I tried. When locked in position it's rigid, easy to adjust and maintains its setting when moving from planing to thicknessing and back again. Rollers on the underside of the main casting contribute to easy positioning across the table. Adjustable stops are provided for 90º and 45º angling of the fence and a large, easy to read scale is provided for angles in between. I found that large work pieces can be confidently pressed against the fence for edge planing without deflection. The resulting finish is very good. Moving to thicknessing requires both in-feed and out-feed tables to be lifted. This is easily done but they're heavy and require a fair amount of strength. The out-feed table has to be raised first and the action of doing this de-activates motor start through a micro switch. Motor start is not re-activated until the chip collector hood is in the thicknessing position, covering the cutters. 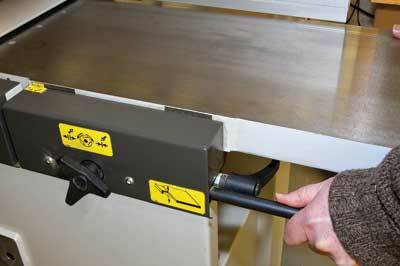 Neither the fence nor the cutter guard has to be moved to raise the table, which speeds up the process. In contrast to everything else on the machine the retaining spring clips to stop the tables falling back down are a little lightweight but seem to do the job. For tables of this weight, dedicated handles are required to give good purchase and would also prevent any chance of your hand getting inadvertently trapped. The thicknessing table is of a very good length (700mm), again a substantial iron casting, giving good support to long work pieces. The length also means that you get excellent visibility of the landing area when feeding material and the overall access to both in feed and out feed is very good. The table lift mechanism is smooth and precise with little backlash and has a locking handle. Rate of lift is 2mm per turn. A clear scale is located on the base unit providing course setting. As per my usual practice I also mark on the base unit next to the hand wheel, the exact position corresponding to a whole mm. Reasonable precision of part millimetres is then obtainable by estimating a number of degrees rotation. For example, 90º rotation from the reference point gives 0.5 mm. A vertical lever engages the thicknesser drive. 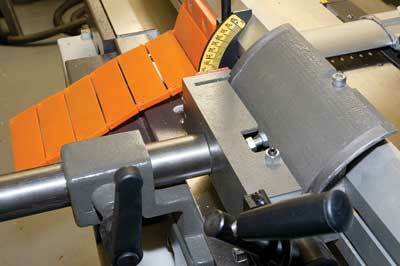 A fixed bar limits entry into the cutters to within the depth of cut specification of 4mm. This was the only issue area I had with my machine as I found it was limiting me to only 2mm. A few phone calls with the Startrite engineers and some adjustments did fix this. Thicknessing of material results in a smooth finish and the received set up of the machine was accurate, giving consistent thickness across the width. Returning to planing mode does require the thicknesser table to be lowered to 175mm so that the chip collector can be rotated back to the lower position. At 2mm per turn this requires a fair bit of wheel turning but is typical of this style of machine. The large back panel is removed by undoing eight internal hex screws revealing a well finished base unit interior with excellent access to all parts and adjustments. 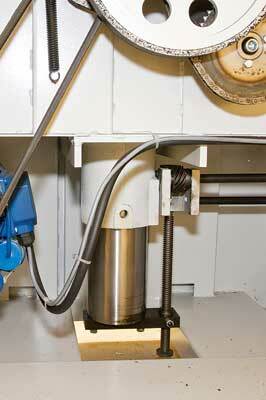 Although the planer is very robust and maintains its settings there's plenty of provision for making adjustments. Overall I am very satisfied with the FS32 machine and would not change my purchase decision. The design and engineering is clearly focused on function and robust enough for a production environment. Of the machines I shortlisted the FS32 is not the cheapest nor the most expensive. The most expensive machine had more options such as a digital hand wheel for thickness setting and a Tersa knife block but the basic construction and quality seemed equivalent.